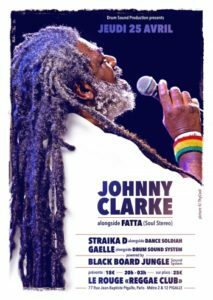 Johnny Clarke will perform alongside Fatta of Soul Stereo at Péniche Henjo in Paris, France on Thursday 25th, 2019. French artists Straïka D, and Gaelle will open the show, organized by Drum Sound System. Black Board Jungle, Dance Soldiah, and Drum Sound System will also be part of the event. Johnny Clarke Will also perform in Roma (Italy), and Bigastro (Spain). If you have never seen him live before, do not hesitate to go check him out if you happen to be around. Get your tickets now!